Dear all, please let me introduce myself first. My name is Alex and I am a watch collector for more than 20 years with main focus on Rolex, IWC, Breitling, Omega and of course Panerai. 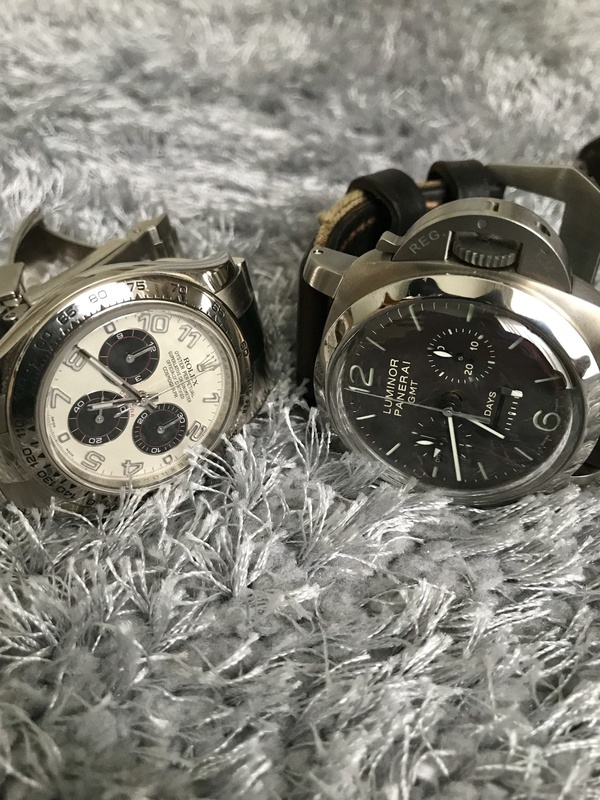 Last year at this time, I was the “lucky” owner of Three Panerai watches. PAM212 (Flyback), PAM141 (Radiomir with JLC Movement) and PAM311 – Luminor 1950 8 Days Chrono Monopulsante GMT in Titan with tobacco dial and a price tag of nearly 18.000 Euro! And today, I sit here in front of my computer to write this story without having any Panerai on my wrist. 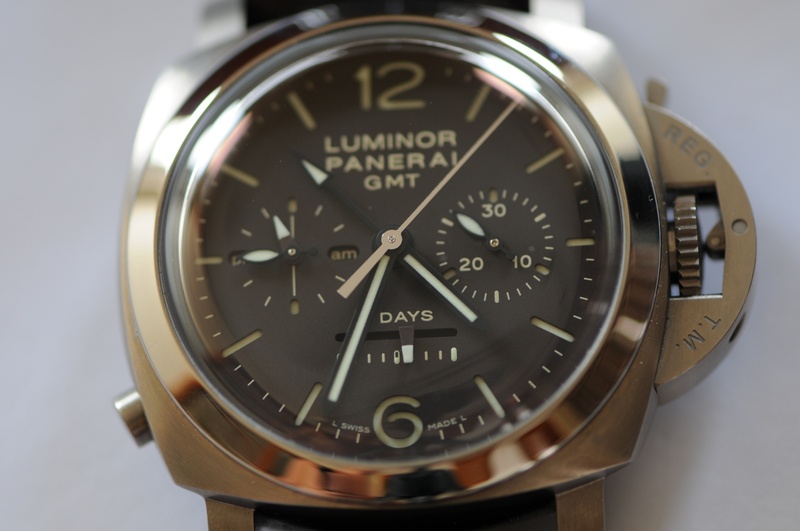 PAM212 and PAM141 got sold by mid of last Year while the PAM311 is with Panerai/Richemont, since more than 12 months! So please, let me share with you my lovely Odyssey with Panerai/Richemont, which has started last year 31st Jan 2017. 31st Jan 2017: I went to the Panerai Boutique to treat my beloved PAM311 with a nice service. The Boutique Manager told me “No Problem” and it would take up to 7 weeks before the watch will come back in good, working condition. Well, sounds promising and I can wear my other PAM’s in the meantime a bit more. So I agreed to the terms and I told the Boutique Manager NOT to polish the watch. The watch has been in an excellent condition and fully functional when I did the hand over the watch to the Boutique. A nice Masterpiece without any flaws. We are pleased to inform that the reparation of your timepiece has been completed and is ready for collection at your earliest convenience. Should you not be able to collect your product in person, please provide an authorization letter and a copy of your legal identification document for the person, which is foreseen to collect your product. According to the agreed Quotation, the charge will be 800 USD. I went to the Boutique to pick up the watch, so far all good. Cannot see any damage and the watch has not been polished, perfect! What a great and fast service from Panerai/Richemont. 18th Mar 2017: The linear power reserve dial is showing 2 days of power reserve left but the watch stopped working. 10th Apr 2017: Back to the Boutique and explained the problem. Manager told me “No Problem” and it will take around 4 weeks to get if fixed. Panerai will of course cover the cost and repair the watch under Repair Warranty. Great! Watch has been repaired and I can jump into the car to pick it up again, what a nice day! Went in to the Boutique with a bright smile and asked for my beloved PAM311. The sales lady went to a room to pick up my watch and came back after a couple of minutes to handover the watch. But hold on, what’s that? A complete scratched bezel! The sales lady gave me a prompt answer “that can happen from time to time but a nice quick polish should solve the problem within no time”. I did refuse the offer to polish and asked to replace the whole bezel instead. The lady told me that cannot happen without approval and she would need to contact the Panerai Service Center first to ask for permissions, which could take a couple of days. 9th May 2017: Call from the Boutique, they offer me to polish the Bezel and the whole case! I did refuse the offer again and told them to replace the bezel only, since the case is in perfect condition still. They need to ask the Service Center again to get permissions to replace the bezel. (I was already wondering how “professional” Panerai work, and do they really care about customer?) The lady promised me to call me back by tomorrow, which was of course not the case. 13th May 2017: No feedback from the Boutique, so I had no other choice than driving there to check the status, again. As soon as I entered the Boutique Miss “that can happen from time to time” came around the corner to shake hands. She apologized and told me she completely forgot to call me back. But I should not be worried anymore, the Bezel will be replaced and the case not polished. Okay, I cannot wait to see the result. 2nd Jun 2017: Email from Miss “that can happen from time to time”. We thank you for your patience and are pleased to inform that the reparation of your timepiece has been completed and is ready for collection at your earliest convenience. Back to the car and all the way to the Boutique, again. I did enter the Boutique and Miss “that can happen from time to time” did welcome me with a big, bright smile. Dear Mr. XXXXX we are so happy to inform you that your watch has been fixed and the bezel replaced. Yeah, and she was absolutely right, the bezel has been replaced and was super shiny. But Stop, what is that mark on the titanium case between 4 and 5 o’clock? A huge, deep, fat and super ugly scratch along the case! 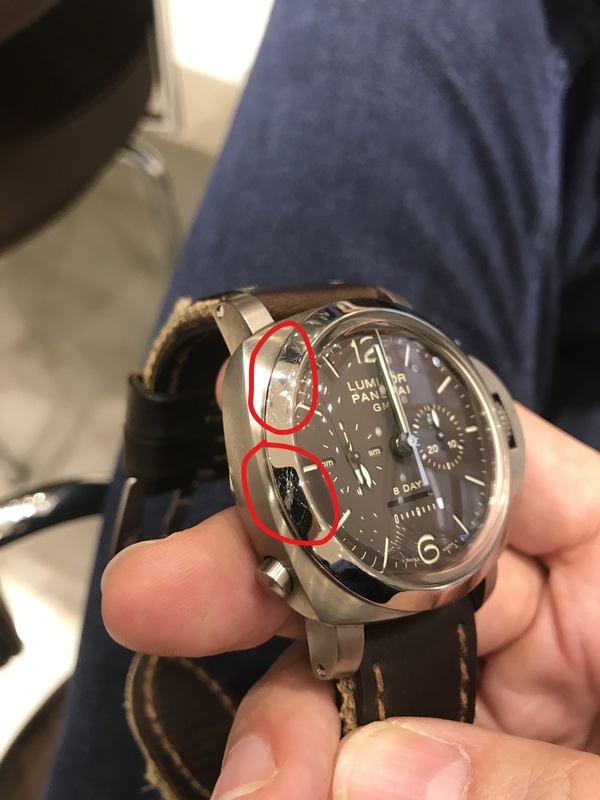 I asked them how this could happen again and if Panerai/Richemont has no proper Quality control in place. No answer. The Boutique Manager went to his room and came back with a small camera. He did start the cam and scrolled through some pictures until he found the pics that he would like to show me. Mr. XXXXX, please have a look on those pictures, can you see all the small scratches around the case? We have removed those and the watch looks now much better than before. I asked him “why did you polish my watch without any approval?” He became silent. But something was not right and felt super strange. So I asked him to show me the pics with the serial number of the watch on his cam. And here we go, he did show me pictures of a PAM311 but not MY PAM311! It was a watch from somebody else with a complete different serial number. So I told him that watch is not mine and he started to search his cam again to find my watch. And after a minute, he could find my watch, without any scratches on the case! He apologized again and did offer me to polish the whole watch. I asked him if I should leave my watch for the trainee program at the Panerai/Richemont Service Center. I refused to polish the watch otherwise it might come back with pink colored hands or plastic pusher button. I told him as well that I will leave not my watch for another terrible service and that I prefer to wear it with this ugly, from Panerai produced, scratch instead. A clean up of my collection will be made in addition and to sale any watches from Panerai asap. I left the Boutique and was very sad what Panerai/Richemont has done to my watch….but the story is not over, yet. 19th Jun 2017: I did try to wind up the linear power reserve hand to 8 days but it did stop at 6 days instead. 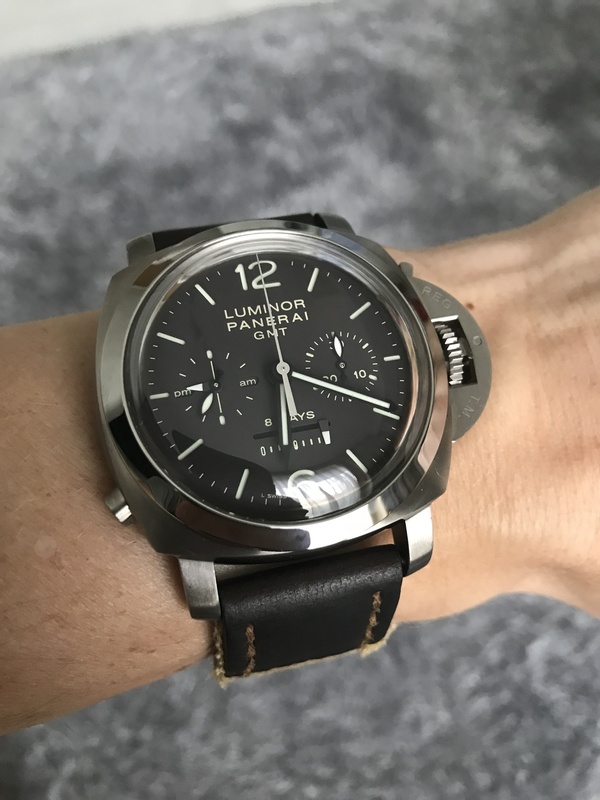 No other choice than going back to the Boutique again but this time I raised the request to send the watch to Switzerland for proper Service, since I have enough of the local Panerai/Richemont service. And as usual: no polishing! We would like to inform you that we will proceed to service your timepiece under Repair Warranty. At this time the watch has received 3 full service within the last 6 months! Complete reassembled and put together again. How would you feel if your car garage is reassembling your car’s engine 3 times within the last 6 months? Would you plan big journeys with the same car still? Anyway, time for service: around 14 weeks. Into the car and to the Boutique again. What will be wrong this time? Watch will fall apart as soon as I use the mono-pusher button? Back to the store to pick up the watch, no scratches at the Bezel and no scratches on the case either. But hold on, how could this be? The watch should have a lovely, fat, deep and for free Panerai Service Center scratch between 4 and 5 o’clock. What did happen? And yes, my nightmare become true – they polished my watch, even without my approval! At that moment the world did fall apart again. I asked the Boutique Manager how this could happen and he told me that I approved the polish procedure. I told him that I did not and showed him all of my Panerai papers within the last couple of months. There was never ever any approval for polishing the case. Well, he did apologize again and I left the store with a “fucked up” Panerai Watch. Bezel replaced, Case polished and 3 times reassembled. Where is the joy to wear such a fake watch, assembled by replacement parts? At least I was feeling happy to have sold my PAM212 and PAM141 already. 30th Nov 2017: I did try to wind up the power reserve linear hand and it stopped at 6 days, again! How could that be? It has been in holy holy holy Switzerland for 14 weeks to get repaired. Or maybe not? herzlichen Dank für Ihre Geduld. Unsere zuständige Abteilung hat bereits recherchiert jedoch können wir anhand Ihrer Nummern nur eine Reparatur nach XXXXXXXXXXX verfolgen. In other words: they can see that I have given the watch to my local Boutique for Service, but cannot confirm the watch has ever been in Switzerland, yet. Auf diesem Wege möchten wir Sie fragen, ob Sie zurzeit in Deutschland wohnhaft sind oder uns freundlicherweise eine Anschrift in Deutschland mitteilen können? They ask me if I live in Germany and would be able to share my address with them. They would like to pick up my watch for Service…. I did send another email to Panerai/Richemont to explain the whole topic, again. ich nehme Bezug auf Ihre Beschwerde an unser Kundencenter. Wir verstehen Ihren Unmut über die bisherige Situation und die Geschichte Ihrer Uhr. Ich habe heute Morgen mit XXXXX telefoniert um mich auf den aktuellen Stand der Dinge bringen zu lassen. Die Aussage die Uhr war NIE in der Schweiz ist falsch. Diese hat bereits die Manufaktur dort besucht. Meine Kollegen haben mir mitgeteilt dass Sie aktuell die Lautstärke Ihres Lünettenklickringes stört. Wir möchten versuchen die Probleme schnell und unkompliziert zu lösen, können Sie mir kurz die aktuell auftretenden Probleme bei Ihrer PAM00311 schildern? Vielen Dank für Ihre Hilfe, und zögern Sie nicht uns zu kontaktieren falls Sie noch Fragen haben. Oh well, I wonder if the Team leader of Customer Service has ever hold a PAM311 in his hands. Click of Bezel, so funny…. He asked me as well to explain all the problems, again. ich verstehe Ihre Unzufriedenheit. Im Grunde genommen bin ich nicht Ihr Ansprechpartner, aber um eine zufriedenstellende Lösung für alle Parteien zu finden bemühe ich mich gerne die entstandenen Probleme zu lösen. Ich habe nur eine Frage an Sie, inwiefern die Uhr nicht läuft nach der Intervention der Schweiz? Ist die Gangreserveanzeige immer noch nicht funktionabel? Der Vorfall mit der Politur ist sehr ärgerlich und soweit nicht zu entschuldigen. Parallel zu meiner Email habe ich bereits die Manufaktur kontaktiert bezüglich den verwendeten Ersatzteile für die Reparatur Ihrer Uhr vor Ort. Zusätzlich möchte unser Panerai Uhrmachermeister Ihnen auch gerne anbieten diese nochmal in unserem Haus unter die Lupe zu nehmen. Wir werden uns um eine schnelle und zufriedenstellende Lösung bemühen. Ich bedanke mich für Ihre Antwort im Voraus und wünsche Ihnen einen erfolgreichen Rest der Woche. Falls Sie noch Fragen haben, zögern Sie nicht uns zu kontaktieren. He is trying hard to solve the problem and he apologize for the not approved polishing of the case. He will try to get some replacement parts for my watch to guarantee a proper repair at my local Panerai Service Center. We thank you for your email and patience. From the Boutique level, in our absence, we checked with our Swiss Manufacturer and they have reverted. 1. We apologize for proceeding with the dial replacement, thou it was provided as complimentary. Indeed, we only had our client’s best interest in mind, in their benefit. 2. On its polishing concern, our Manufacturer have confirmed that no polishing was done, as we had alerted them on your request. Hence, only cleaning was done on your timepiece. Thou it was stated on the Billing summary upon your collection, it was omitted to be removed on our end. Again, we apologize for the error, and only to cause anxiety to you. 3. Lastly, regards to the “Automatic clicking sound”, our Manufacturer urged for your timepiece to be transferred back to them. For their further investigate for analysis, and to enlighten the concern. From the view of the Service Center and our Swiss Manufacturer, they want to ensure that the timepiece is returned back to client in a good working order, internally and externally. We trust that this information meets your needs and remain at your disposal, should you have any other enquiries or require further details. We look forward to your favourable reply. Again, thank you and wishing you and family a Merry Xmas and Happy 2018 ahead." And, the watch needs to go back to Switzerland again, another Service is calling. I am not sure what I should say but such a bad service should not exist. If I would deliver such service to my customers, I would be gone by now and kicked out by my company. We don’t talk about a 100 Euro watch from China, we talk about an 18.000 Euro time piece from holy Switzerland with highly paid managers and watchmakers. I did try to contact my local Panerai Brand Manager or even the Big Boss Lady from Richemont in my country. Unfortunately, without any luck. I assume they are too busy to buy proper watches during Xmas time. Like for example watches from Rolex or Patek, but for sure not from Panerai. I have given a perfect working watch without any damage or scratches to Panerai for a simple Service. And now, nearly 12 months later I wear a Rolex Daytona on my wrist. The PAM311 has received a new dial, new hands, new barrels, new bezel, a complete polish without my approval and got reassembled 5 times so far. And the watch is still not working and somewhere between Timbuktu and the Moon to wait for another Service. The watch does not belong to me anymore and I will have no pleasure to wear it. Panerai/Richemont has taken my watch apart, including all the history and experience that I had with that watch! And I paid 800 USD to get trash back, thank you Panerai and Richemont….never again. Quick update: I had a very friendly discussion with the Managing Director of Panerai yesterday AND I got my watch back! Are you keeping the watch??? I've seem similar issues on damage to watches after sending them in for servicing. This was a Panerai Hallmark for many years! I have had similar issues with Panerai even been accused of damaging the watch myself!!! Watch has been send to Panerai Boutique, again. And as usual: no response from the Panerai Team.